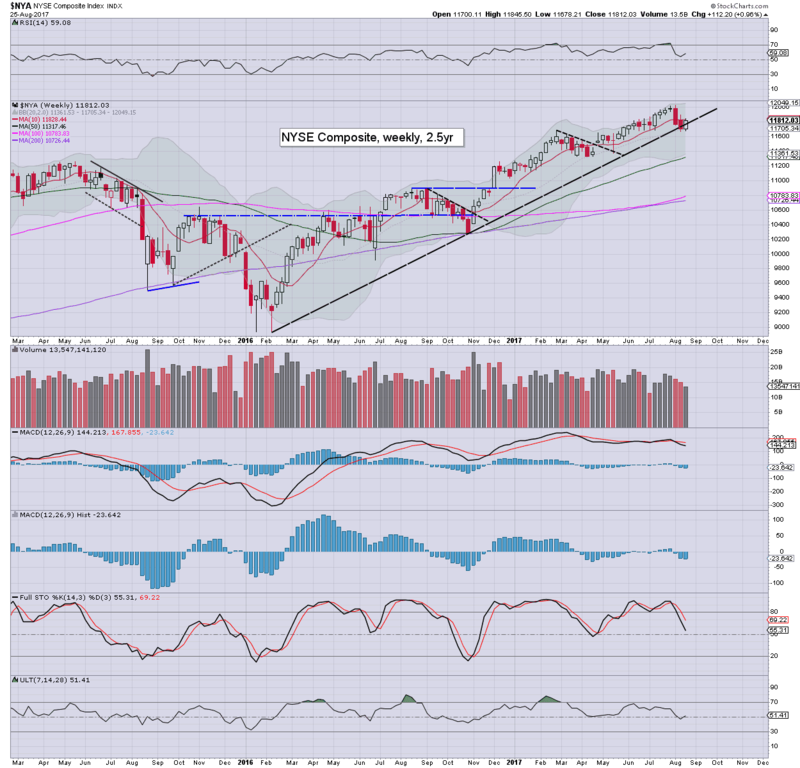 US equities ended the month on a positive note, sp +14pts at 2471. The two leaders - Trans/R2K, settled +0.1% and 1.0% respectively. 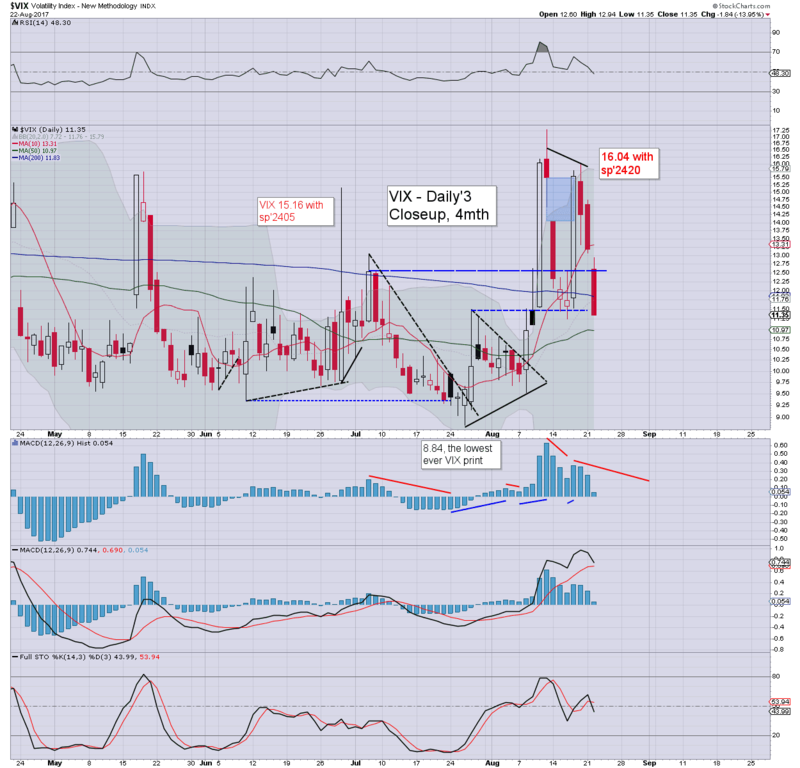 VIX settled -5.6% at 10.59. 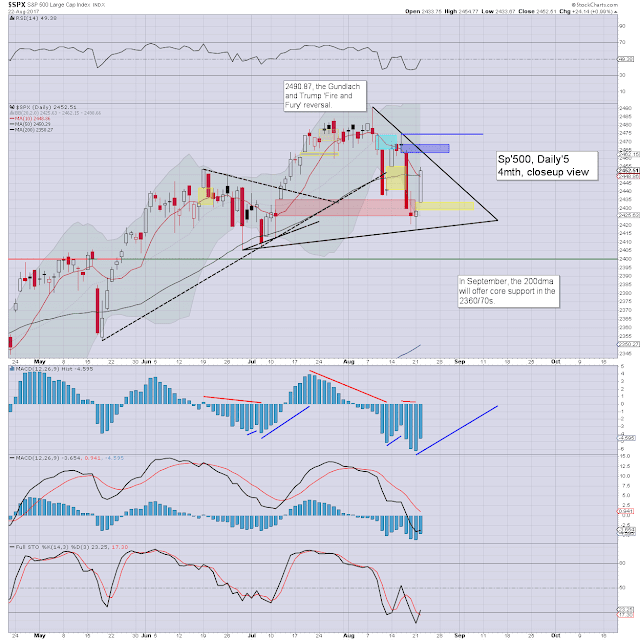 Near term outlook offers minor weak-chop into the 3 day holiday weekend. 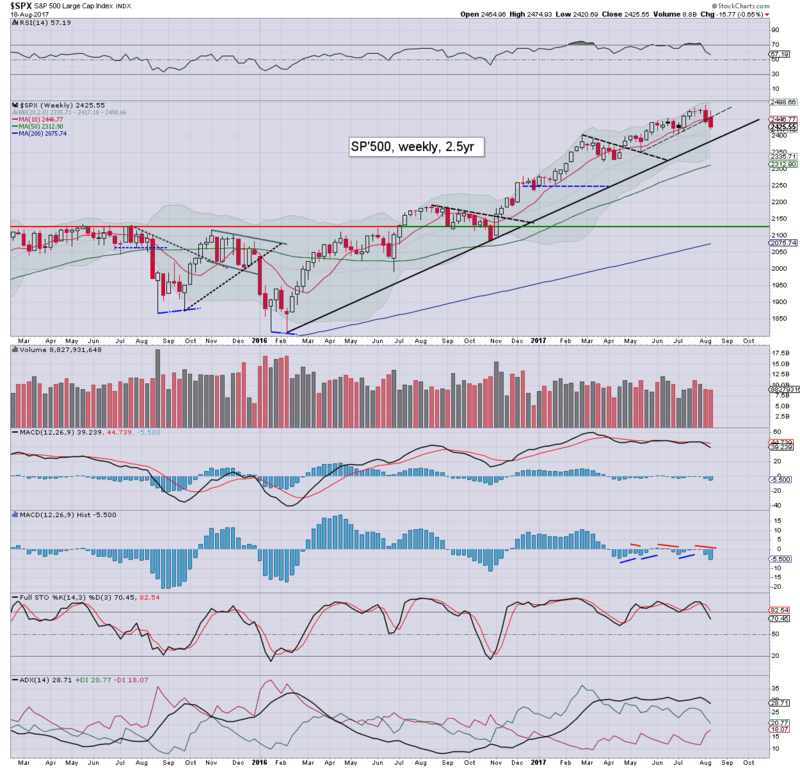 Sept/Oct' offers a 4-5% downwave to the sp'2350s. US equities opened a little higher, and much like yesterday, clawed upward. The key gap zone of 2462/68 was fully filled, and we even broken into the mid 2470s. There was something of a subtle reaction from 2475 in the closing hour. 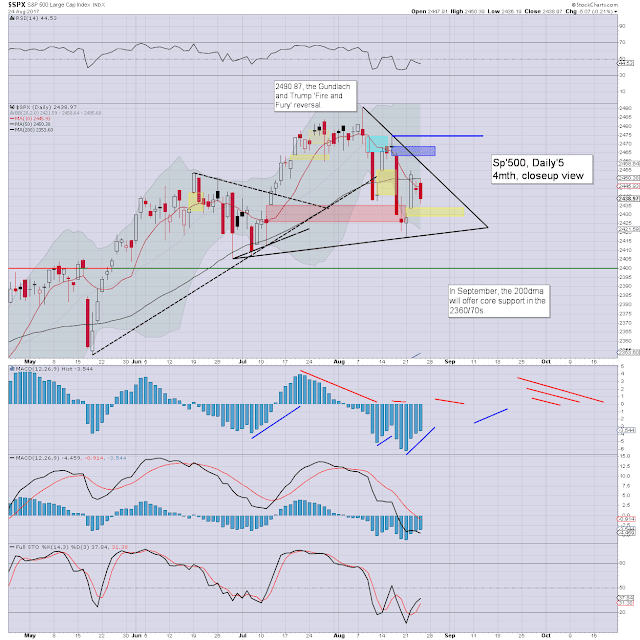 Near term outlook offers a gap fill of 2462/57 within 1-3 days. Things only get interesting with a break under the Aug'21st low of 2417. With equities rising, volatility was ground lower for a second day, with the VIX settling the month in the mid 10s. A surge to the key 20 threshold looks highly probable within Sept/Oct'. A fifth consecutive net monthly gain, with a notable new historic high of 2490. 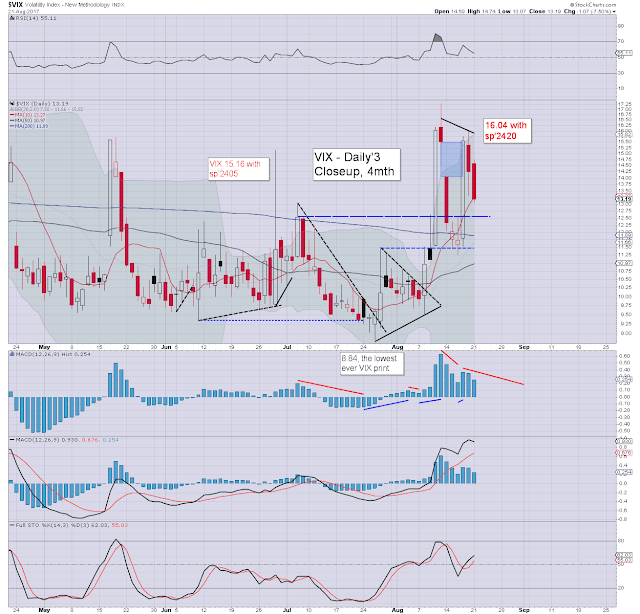 Unquestionably, the current remains outright bullish. From tomorrow onward, the key 10MA will be somewhere within the 2390s. A September close under it would merit alarm bells. We shall see. US equity indexes closed moderately higher, sp +11pts at 2457. The two leaders - Trans/R2K, settled higher by 0.8% and 0.5% respectively. 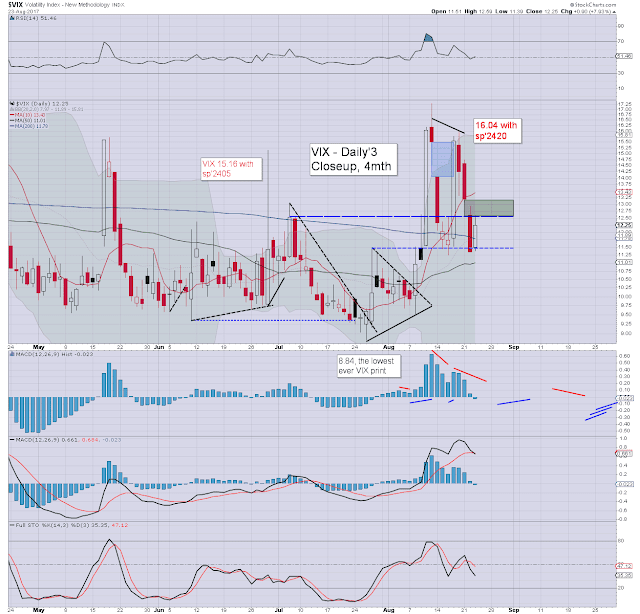 VIX settled -4.1% at 11.22. 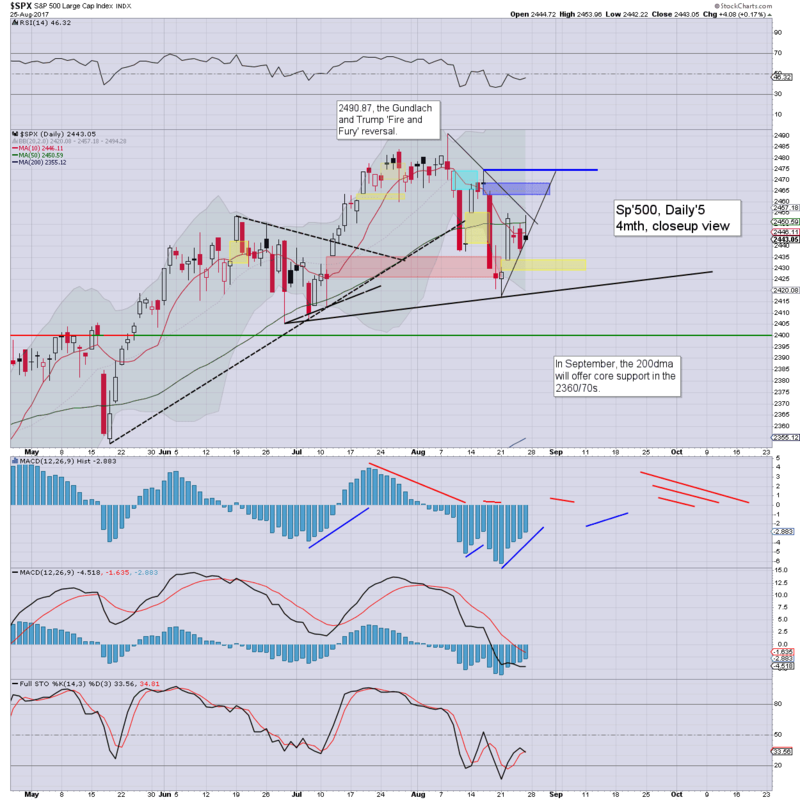 Near term outlook offers a little chop, but prime target of sp'2462 remains due before the long weekend. US equities opened in minor chop mode, but then quickly reversed upward, as it became a case of algo-bot upward melt. 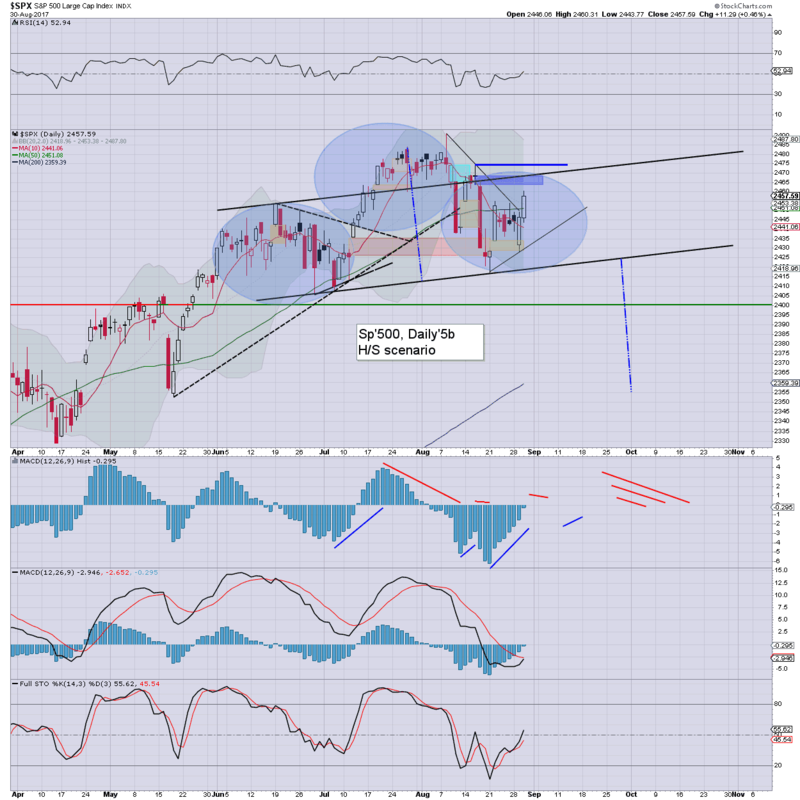 The sp' saw a high of 2460.31, still a notable 2pts shy of prime target, which remains a 'technical necessity'. Thursday offers weak chop, with another viable wave upward on Friday. Market volatility was subdued, with the VIX briefly breaking into the 10s, and settling in the low 11s. 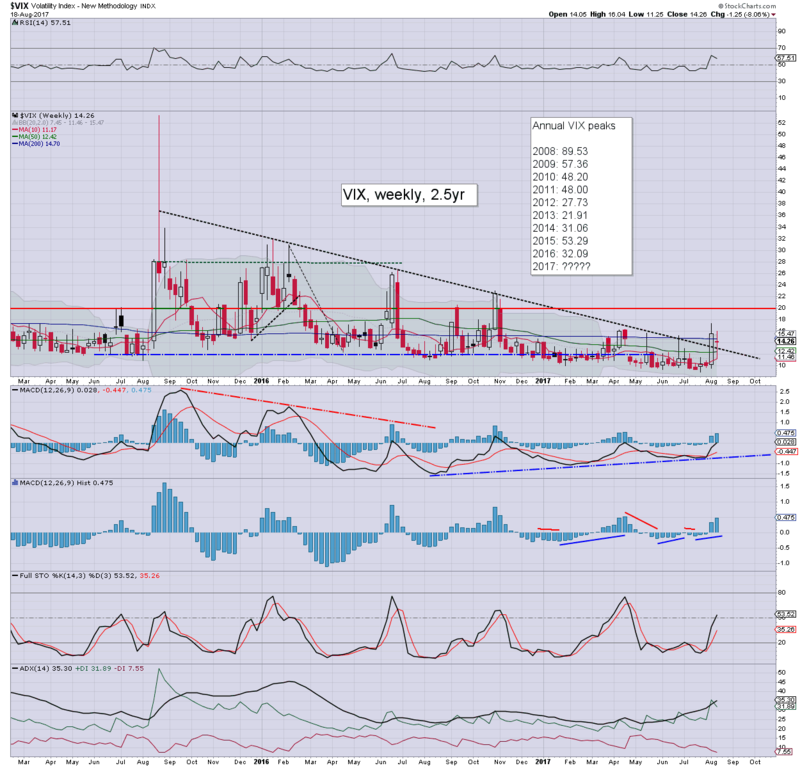 Another surge in the VIX seems due within a week or two, although the key 20 threshold looks far more viable in October. The 3 day holiday weekend will soon be here, and my thoughts are already stretching ahead to what is the 'delicate period' of Sept-October. There is already the usual crashy talk from the usual suspects, whilst most others are just expecting a 5% correction, before pushing upward into spring 2018. As things are, I'm with the latter. The following is something a fair few others have noticed, and are seeking to play out by mid October. Effectively, near term maxing out within the 2460/70s, then a week or two of chop, and eventually breaking the neckline, the key low of 2417, and declining to the 2350s. In the scheme of things, such a wave would only be moderately exciting, but it'd make for at least a couple of trades. 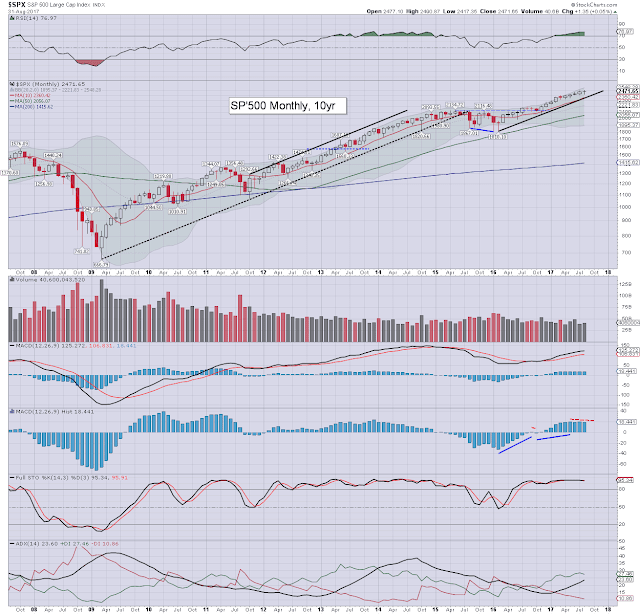 Things only turn outright bearish with a monthly close under the 10MA. 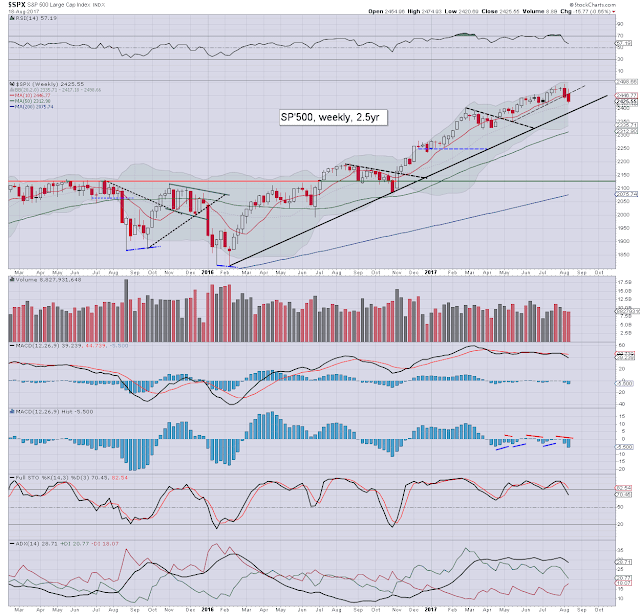 Currently that is in the sp'2350s, and will jump to the 2380/90s for Sept', and 2410/20s in Oct. Keep in mind the R2K has been leading the way lower, followed by the NYSE comp'. 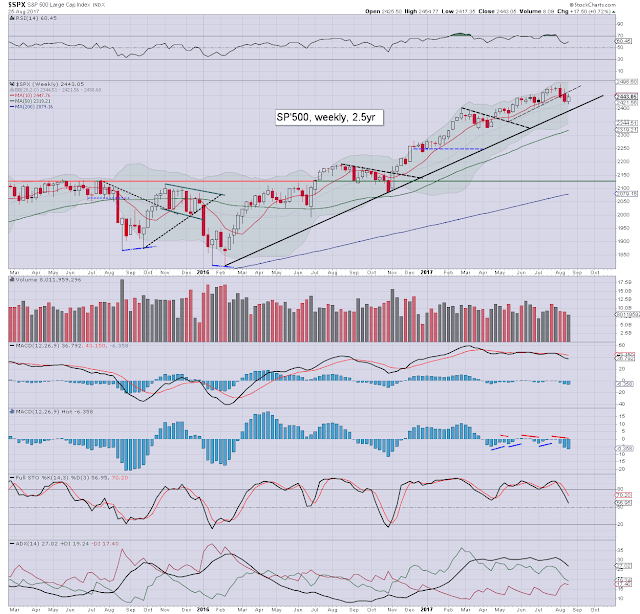 A Sept' or October close under the monthly 10MA would merit alarm bells, and offer a 20% down wave. Right now, I do NOT expect such a monthly close. US equity indexes closed a little higher, sp +2pts at 2446. The two leaders - Trans/R2K, settled higher by 0.9% and 0.1% respectively. VIX settled +3.4% at 11.70. Near term outlook still offers a hit of prime target of 2462, before high probability of a 4-5% down wave in Sept/Oct. 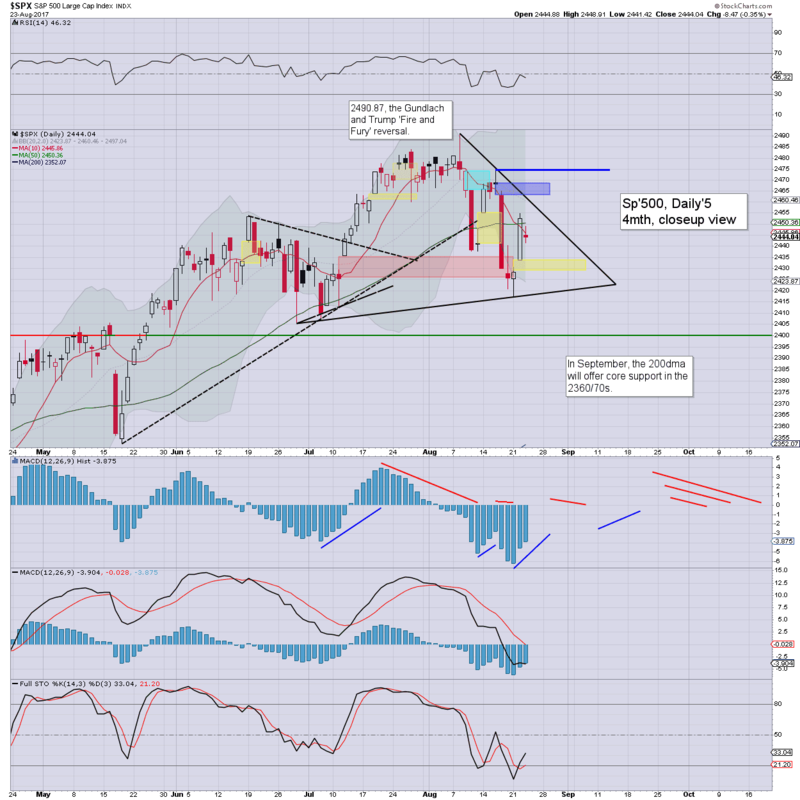 Sporadic 'spooky news' - as I like to call it, will always be a problem to the equity bulls. Yesterday afternoon (around 5pm EST), saw a missile launched from North Korea, flying over Japan, and landing somewhere in the western pacific. Will things spiral out of control in east Asia this Sept/Oct? 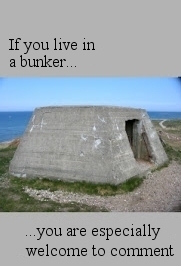 Or will the DPRK continue to play their little games? Perhaps the biggest unknown is whether Trump will just decide to launch an all out pre-emptive strike. Perhaps you remember what the Chinese leadership said recently? As for the US equity market, we saw an opening low of sp'2428, notably filling the gap zone from August 22nd. The key low of 2417 comfortably held (including overnight futures trading - with a low equiv' to 2422). There was a notable reversal from the open, and the market battled upward all the way into the close. Market volatility jumped, with a pre-market high of 14.34, opening at 13.33, but then cooling across the day, settling in the 11s. 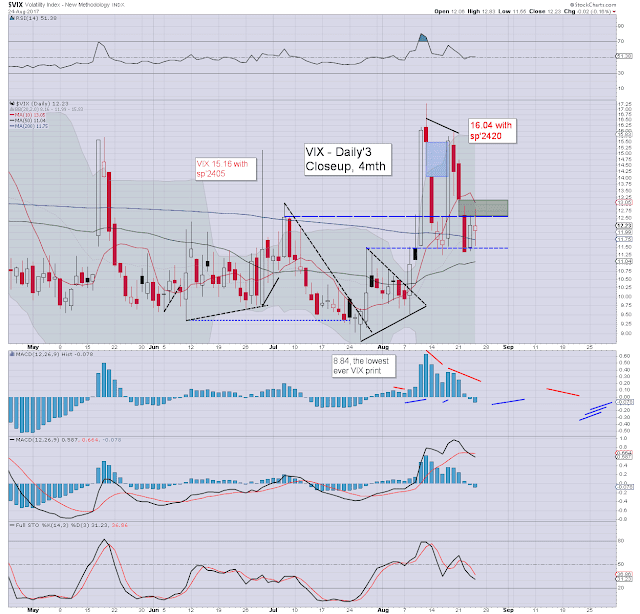 Near term outlook still offers the sp'2462/68 zone, which should equate to VIX 10s. US equity indexes closed a little higher, sp +1pt at 2444. The two leaders - Trans/R2K, settled higher by 0.2% and 0.4% respectively. VIX settled +0.3% at 11.32. Near term outlook offers prime target of sp'2462, before high probability of a key lower high into the 'delicate period' of Sept/Oct. US equities opened fractionally higher, and then just saw minor chop across the day. Its also a little apparent that some traders are already slipping into pre-holiday mood, and that leans in favour to the bulls. A few instances of algo-bot upside melt is very probable this week. Market volatility opened a little weak, spiked to the low 12s, but settled just a little higher. The sp'2462/68 zone should equate to VIX 10s. The 9s look a stretch, although its not like we've not seen those regularly this year! The UK was largely closed today, with a late summer 'bank holiday'. Yours truly was naturally still typing, and is most certainly looking forward to Labor day next Monday :) I just wish the US had more public holidays than the UK, its one of the downsides to living/working US hours/days. 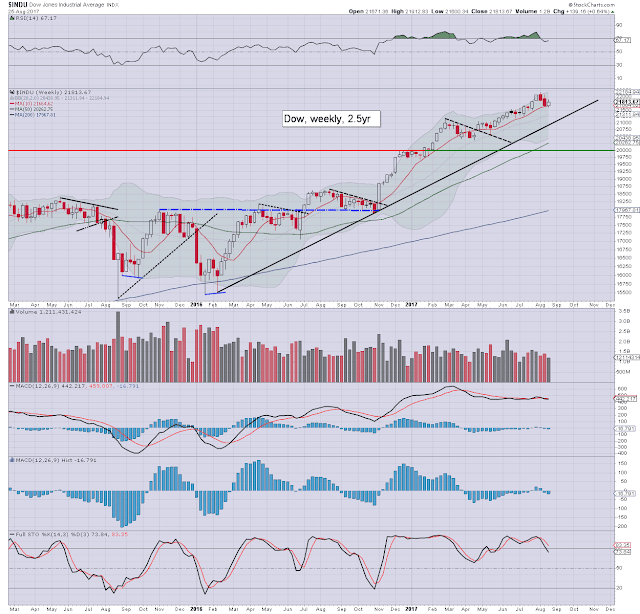 It was a bullish week for US equity indexes, with net weekly gains ranging from 1.4% (R2K), 0.7% (sp'500), to 0.4% (Trans). Near term outlook offers upside into end August/early September of 1-2%. Recent breaks of core rising trend in the R2K and NYSE comp', argue against any further historic index highs until at least November. 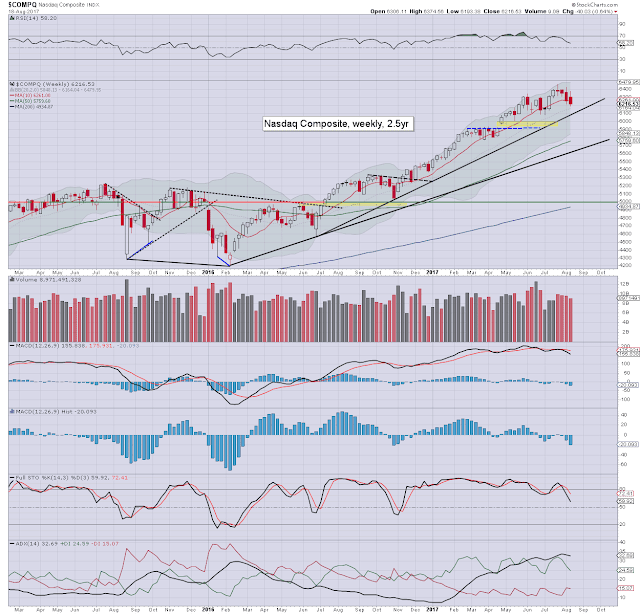 A net weekly gain of 17pts (0.7%), settling at 2443, the third consecutive weekly close under the key 10MA. Core rising trend will be around 2400 next week. Underlying MACD (blue bar histogram) is on the moderately low side, a few weeks ticking back upward, toward the zero threshold into mid September is probable. Best guess: near term upside to the 2460/70s, before renewed downside to test multiple aspects of support around 2400, certainly by late Sept/early Oct'. Special note: the recent break of core trend - from early 2016, in the R2K and NYSE comp' argues that other indexes will eventually follow. From the Monday Oct'2nd open onward, equity bears only need to see the market trade <2400 to break multiple aspects of core support. If that is achieved, then the door is open to far lower levels. 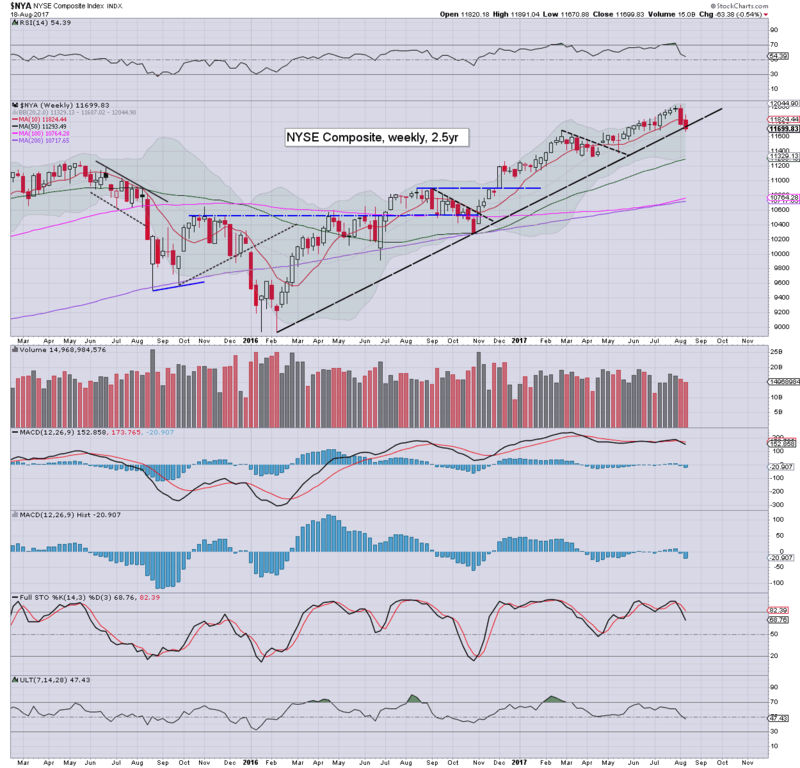 The first net weekly gain for the Nasdaq in 5 weeks, settling +0.8% at 6265. First rising trend from June 2016 will be around 6150 into end month. There is major support within the 6000/5900s. Equity bears need to break <5700 from mid September onward to break core rising trend from Feb' 2016. From there, it would be open air to the giant 5k threshold, which is a clear 20% below current levels. The mighty Dow gained 139pts (0.6%) to 21813. Its notable that the recent historic high of 22179 is a mere 1.7% higher. The Dow is one of the stronger indexes, and has been sustainably holding above the key 10MA since late April. From October onward, if the equity bears can break <21k, its empty air to the giant psy' level of 20k. 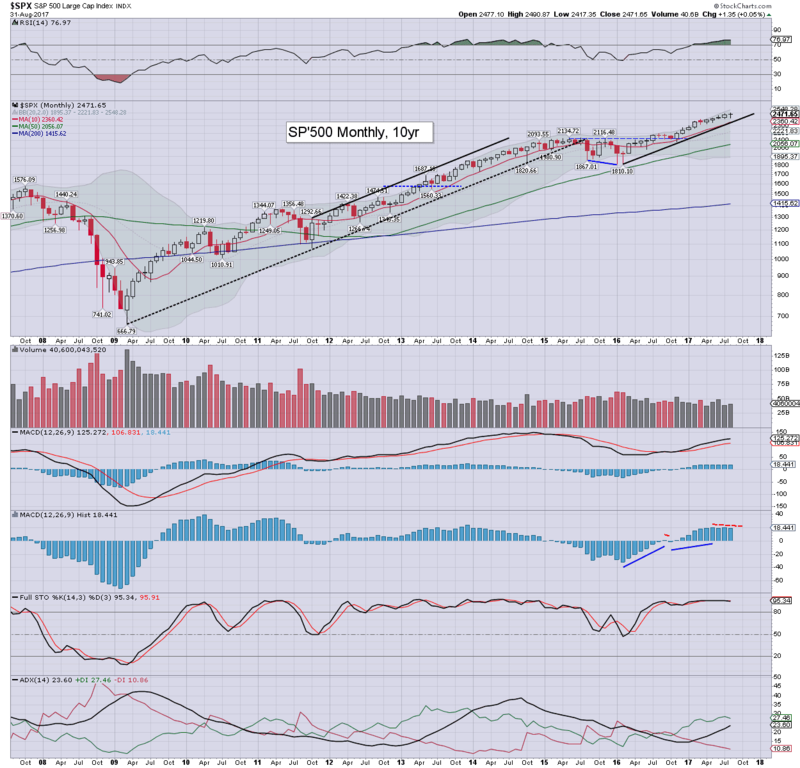 Further, keep in mind the monthly 10MA will be around 21k from September onward. 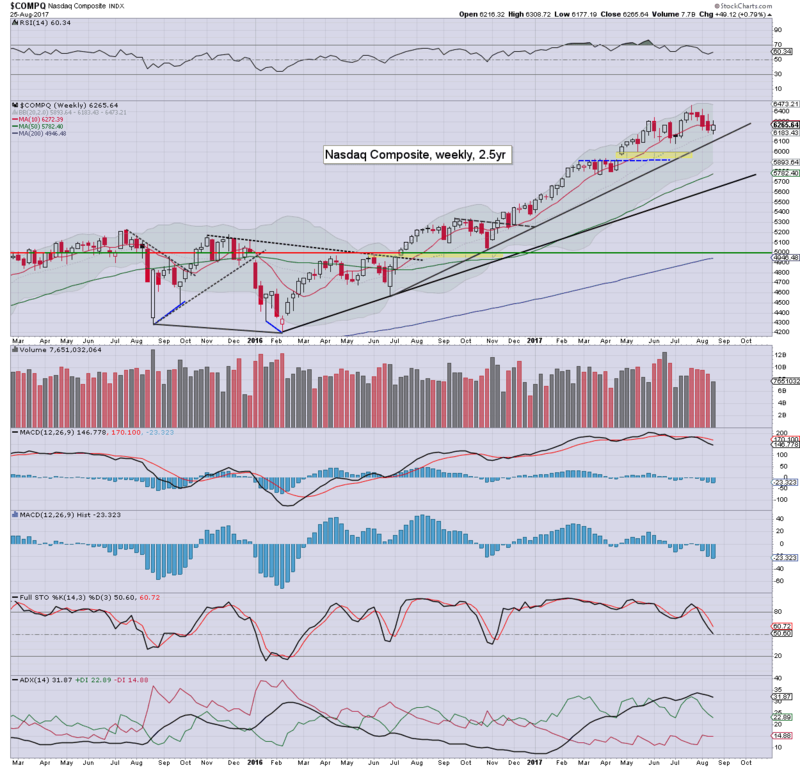 The master index gained around 1.0%, settling at 11812, but remains under the key 10MA. Last weeks break of core trend is important, and would arguably only be fully negated with a new historic high (>12019). If the bulls can only manage a lower high into September, first downside target will be the lower weekly bollinger, which by late September will be around the 11500/400s. The second market leader - R2K, settled +1.4% at 1377, the first weekly gain in 5 weeks. Underlying MACD (blue bar histogram) is on the very low side, and could easily tick upward for 2-3 weeks. Further upside of around 2% looks probable, with multiple aspects of resistance around the 1400 threshold. Considering the recent break of core rising trend, the July historic high of 1452 looks out of range until at least November. On any renewed downside, first soft target is the 1300/1280 zone. The 'old leader' - Transports, remains the market laggard, settling +0.4% at 9133. 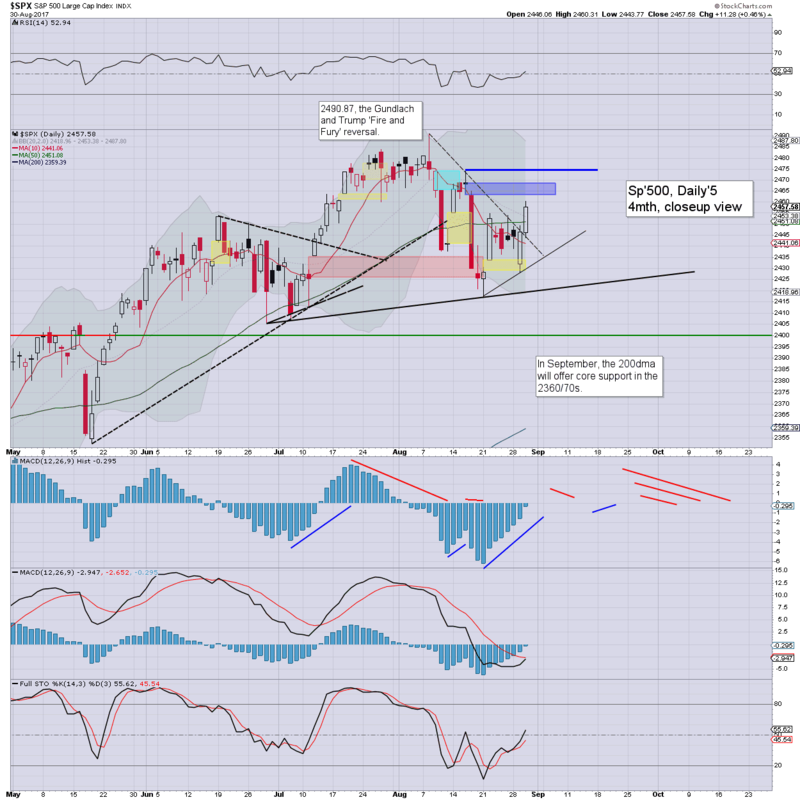 The 9k threshold is natural psy' level support, and further upside to the 9300/400s is due within the immediate term. From early September onward, core support - from early 2016, will be around 8700. 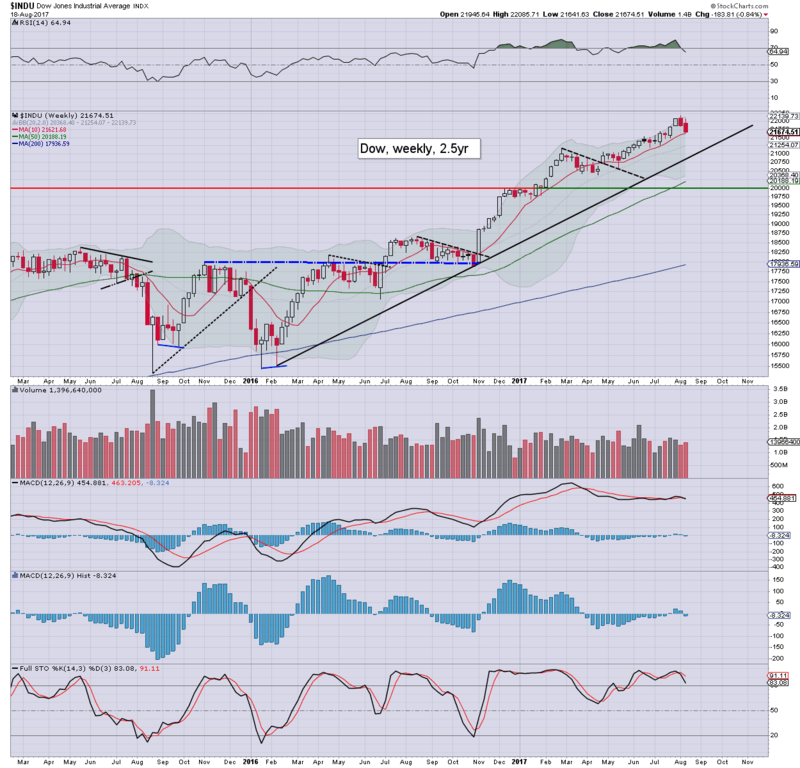 A bullish week for all six US equity indexes, with the R2K leading the way, and the transports still lagging. Four of the six indexes are still holding core rising trend that stretches back to early 2016. The R2K and NYSE comp' are notably 'broken'. A near term bounce of 1-2% is highly probable, but considering the R2K and NYSE comp', no new historic index highs can be expected in September. Instead, another wave lower of 3-5% seems highly probable, no later than mid October. Things would only turn very bearish if a number of indexes ended September under their respective monthly 10MAs. F - Vehicle sales, monthly jobs, PMI/ISM manu', construction, consumer sent'. *Monday Sept'4th is Labor day, and the US market will be CLOSED. Friday Sept'1st will thus be inclined to be very subdued, once the econ-data is out of the way, as many traders will make an early escape for the 3 day holiday weekend. US equity indexes closed moderately mixed, sp -5pts at 2448. The two leaders - Trans/R2K, settled -0.7% and +0.3% respectively. VIX settled -0.2% at 12.23. 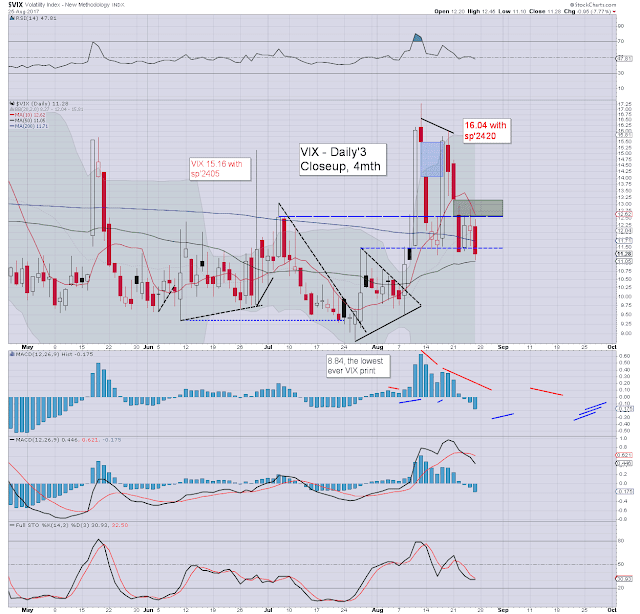 Near term outlook offers a tag of the 2462/68 gap zone. The more bullish should be seeking a daily close >2474 before end month. 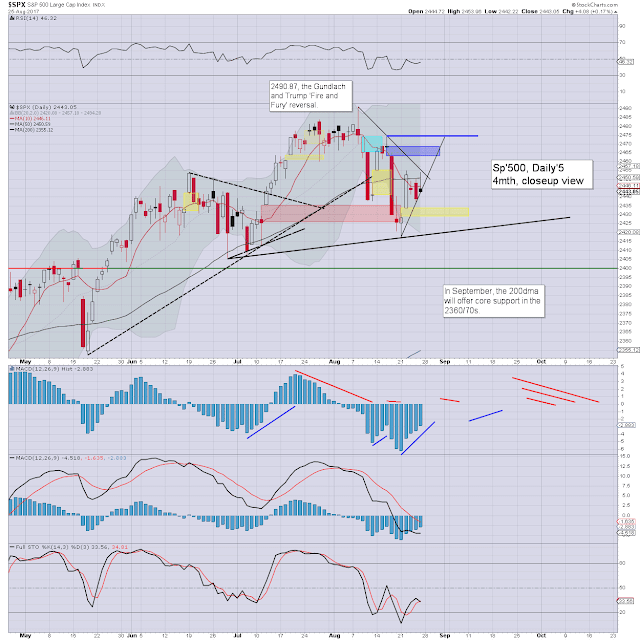 US equities opened a little higher, but there was a rather clear opening reversal, and the market choppily fell into the early afternoon, flooring from sp'2436. The closing hour was a little weak, but cyclically, we're on the low side, and the setup favours the bulls into the weekend. Market volatility opened moderately lower, and swung upward as equities cooled, but only reaching the upper 12s. 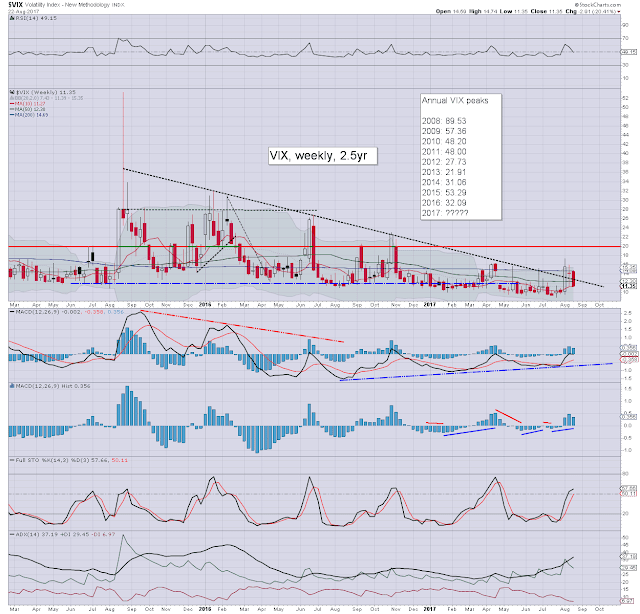 Its notable that despite some closing hour equity weakness, the VIX still closed net lower. Nothing has changed, a tag of 2462/68 remains due... whether Friday or early next week, it should make little difference to those currently holding long. 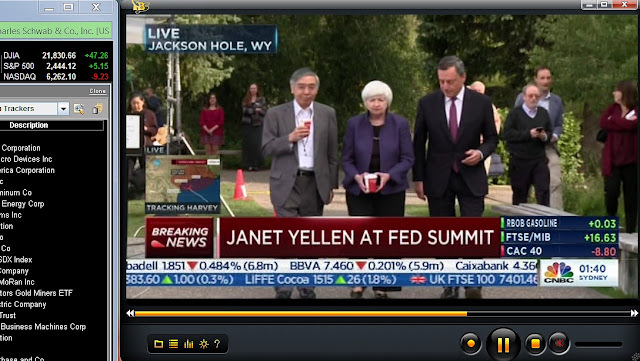 Fed chair Yellen is due to speak at Jackson Hole, Friday, 10am. That will clearly have the market's full attention. So, what will the CEO of Print Central say? Will she threaten 'easy money', or instead allude to a rate hike at the December FOMC ? Then there is the issue of balance sheet reductions. The plan has already been fully published, and even if started in September (now seemingly unlikely), it will take at least a year to really be of any significance. Lets be clear, the financial stocks need a rate hike, and have been broadly stuck since the early spring. Its difficult to see those highs broken until it becomes clear another rate hike is due. It remains the case that the absolute worse thing for the equity bulls - the 'ultimate alarm bell', would be if the fed cut rates. Its a simple chart, but it merits at least a few minutes of staring! .. and another summer's day... passes by. 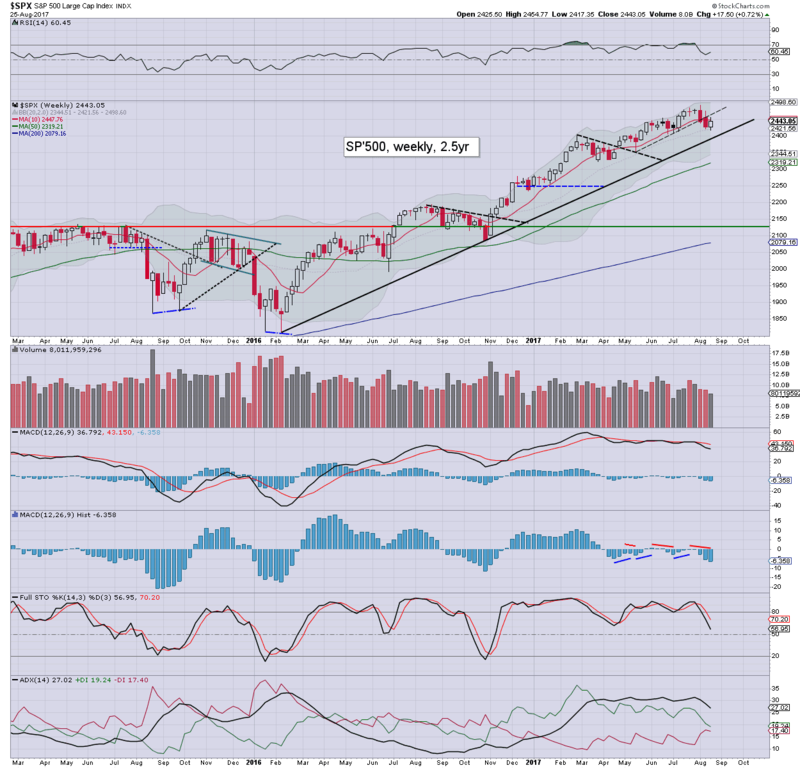 US equity indexes closed broadly weak, sp -8pts at 2444. The two leaders - Trans/R2K, settled -1.2% and -0.1% respectively. VIX settled +7.9% at 12.25. 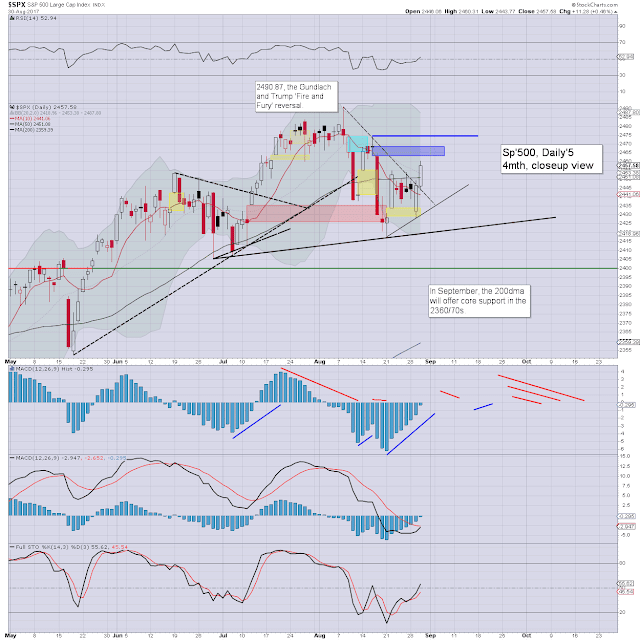 Near term outlook offers upside to at least partly fill the gap zone of sp'2462/68. For confidence, the bull maniacs need a daily close >2474. US equities opened moderately lower, and remain in weak chop mode for the entire day. The smaller 60/15min cycles are now less overbought, and there is high probability of another push upward across Thurs/early Friday to the 2462/68 zone. Volatility jumped at the open, and tagged the lower end of a minor gap zone, before settling a little below the opening highs. Bouncing for a lower high? US equity indexes closed significantly higher, sp +24pts at 2452. The two leaders - Trans/R2K, settled higher by 0.9% and 1.1% respectively. VIX settled -13.9% at 11.35. Near term outlook threatens a little weak chop, but more broadly, minimum target remains the gap zone of sp'2462/68. US equities opened moderately higher, and built rather significant gains into the late afternoon. Certainly, the gains were stronger than expected, and the close above the 50dma bodes for further upside within the immediate term. There will be major resistance within the gap zone of 2462/68, and from last Wednesday's high of 2474. 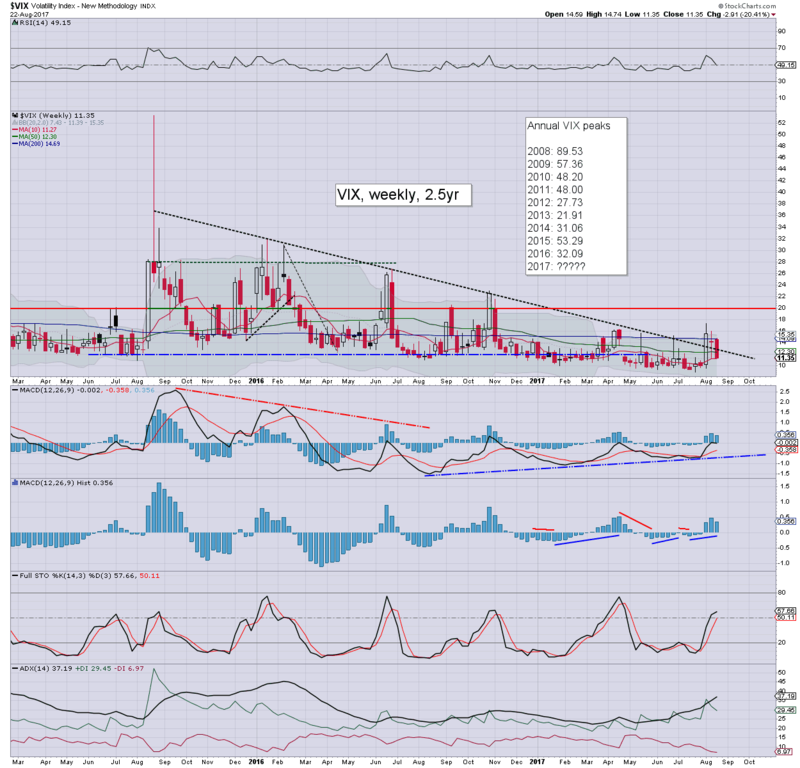 Market volatility was crushed lower for a third day, and cyclically, we're due a bearish MACD cross at tomorrow's open. 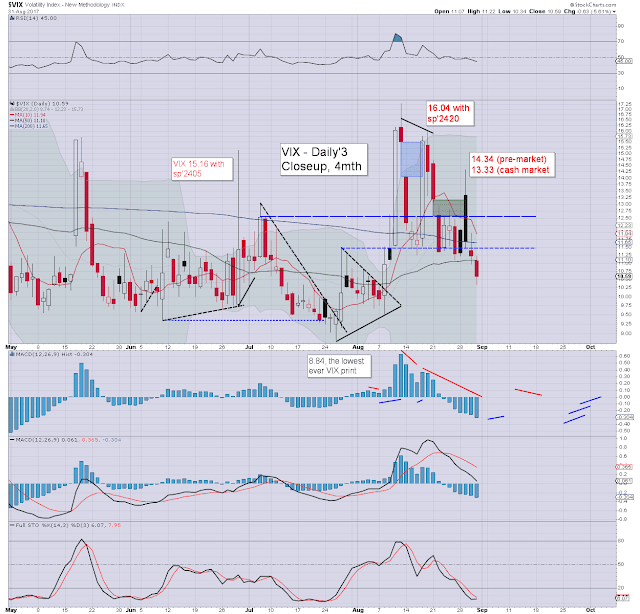 In theory, the VIX could remain under downward pressure all the way into the weekend. The 10s look probable with sp'2462. The 9s look a stretch, unless the market can achieve a daily close >sp'2475, and that looks difficult until at least next week. The key issue now is whether the market puts in a lower high (<sp'2490), or can eventually push to new historic highs in September. The bulls really need to achieve a new high, as there are multiple aspects of support, which must remain intact, otherwise the situation would start to mirror what has already occured in the R2K and NYSE comp'. The series of lower highs from Aug'2015 has concluded, and that is an issue not to be dismissed lightly. US equity indexes closed fractionally mixed, sp +2pts at 2428 (intra low 2417). The two leaders - Trans/R2K, settled +0.3% and -0.1% respectively. 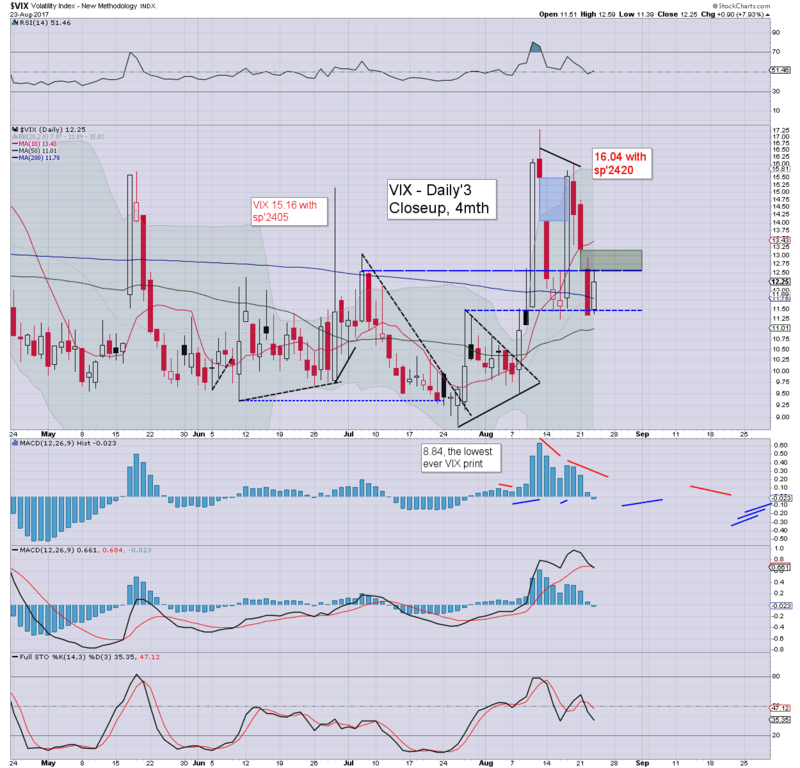 VIX settled -7.5% at 13.19. Near term outlook offers choppy upside to the gap zone of 2462/68. From there, things get real divisive. US equities opened in minor chop mode, and saw a moderate down wave to floor at sp'2417. There was something of a latter day recovery, with the daily candle offering a somewhat spiky floor. There is basic upside to 2462/68, which is clearly going to mean the market will soon be above the 50dma (around 2450). The VIX opened a little lower, saw a brief bounce to turn fractionally positive, but was then ground lower all the way into the late afternoon. 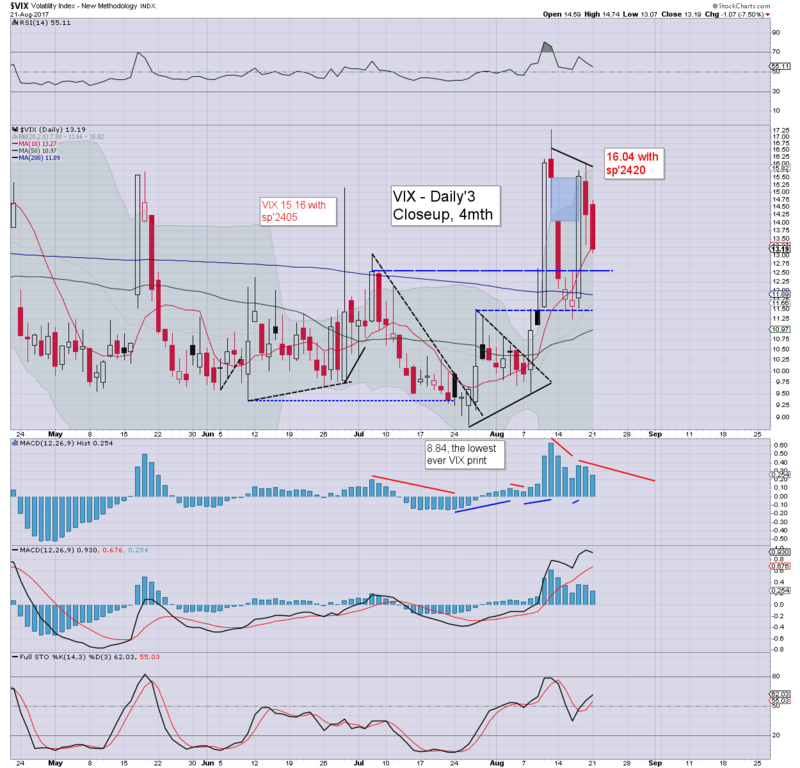 Near term offers sp'2462/68, which will probably equate to VIX 11s. Where we go from there... is the grander issue. I'd refer anyone to the weekend post. It was a bearish week for US equity indexes, with net weekly declines ranging from -0.5% (NYSE comp'), -0.6% (sp'500, Nasdaq comp'), to -1.2% (R2K). Near term outlook offers a bounce of around 1.5%, but if the market can't achieve at least a couple of new historic highs by mid September... it would be a serious issue. The sp' settled net lower for a second consecutive week, -15pts (0.6%) at 2425. 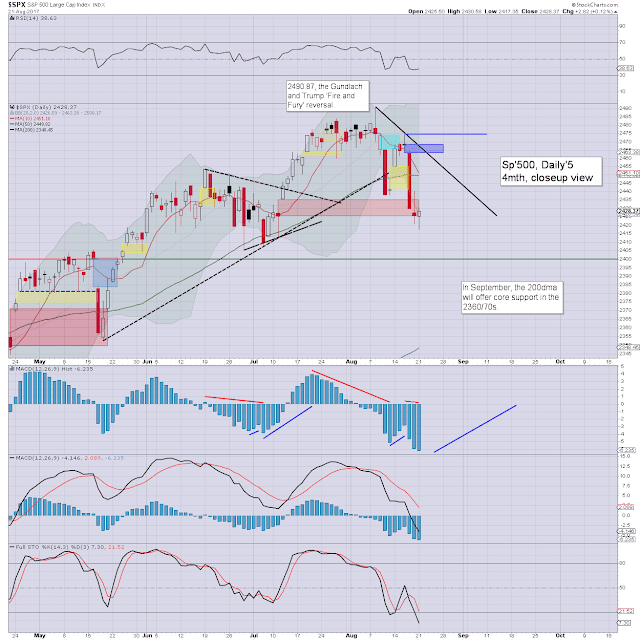 Short term rising trend from mid May has been broken. Underlying MACD (blue bar histogram) cycle continues to tick lower, as price momentum increasingly favours the equity bears. Best guess: a near term bounce to at least 2462/68. A daily close >2474 will offer new historic highs to the low 2500s in September. A 5% retrace looks very probable within the late Sept/early Oct' period. The year end target of 2683 remains on track. Equity bears have nothing to tout unless a break under 2360/50, where the monthly 10MA, 200dma, and rising trend - from Feb'2016, all intersect. Keep in mind, those numbers are rising with each month. The tech settled lower for a fourth consecutive week, -0.6% at 6216, the most bearish run since May 2016. Price momentum moderately leans to the bears, and in theory, could tick lower for another 2-3 weeks. There is huge support within the 6000/5900 zone. 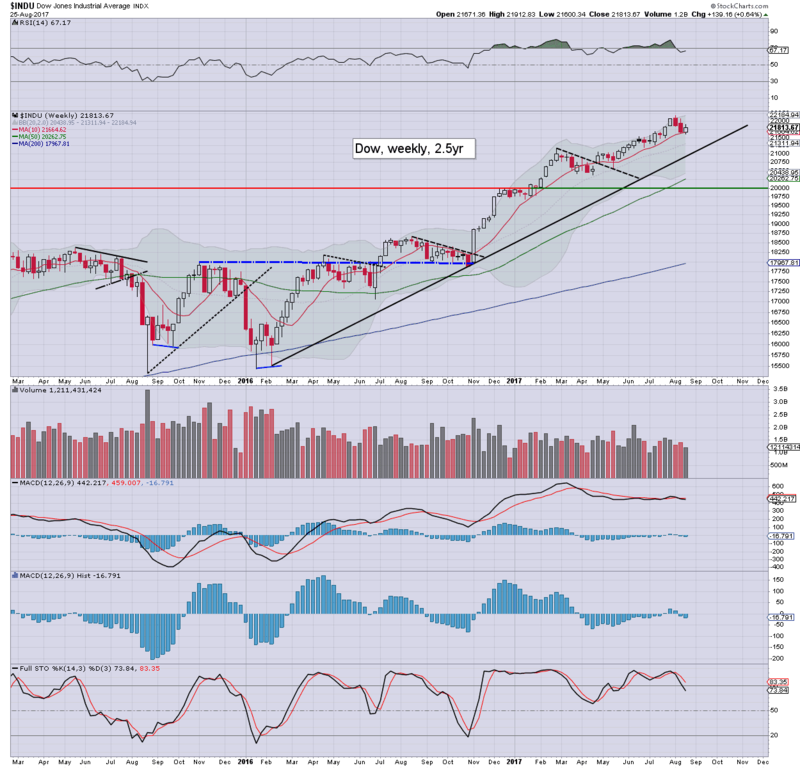 It will be important for the equity bulls to break >6460 in the next multi-week up cycle within Sept/Oct. A lower high around 6300, with a new low under first rising support (<6100) would be a serious problem. 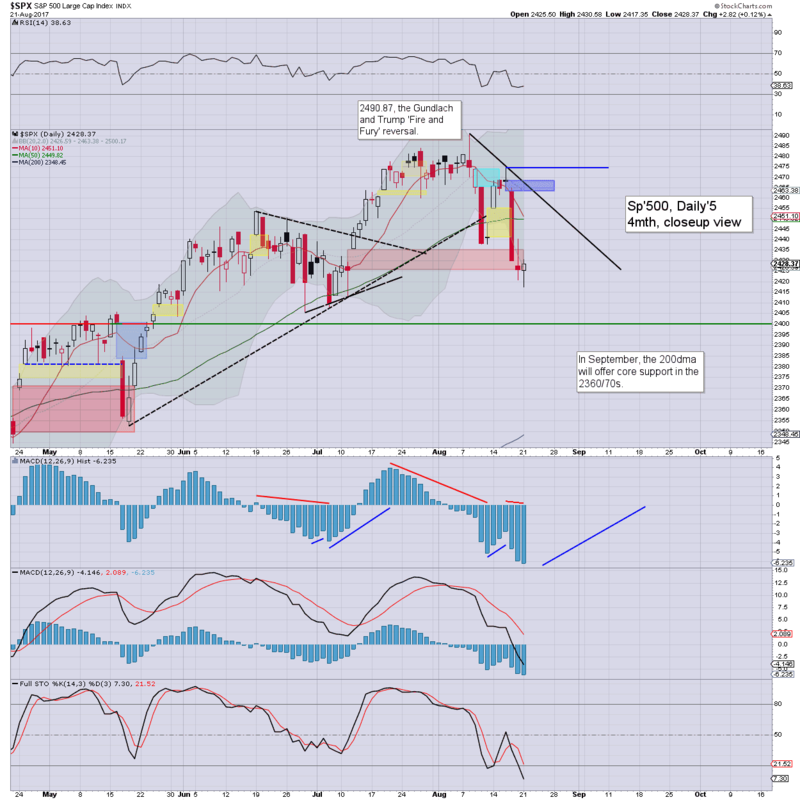 The mighty Dow settled lower for a second week, -0.8% at 21674. A bounce to the 22000 threshold is highly probable within the very near term. A marginally lower high (<22179) would be a problem for the equity bulls. First soft support is the rising 10MA - in the 21600s, then core rising support in the 20900s, rising to 21k in early September. 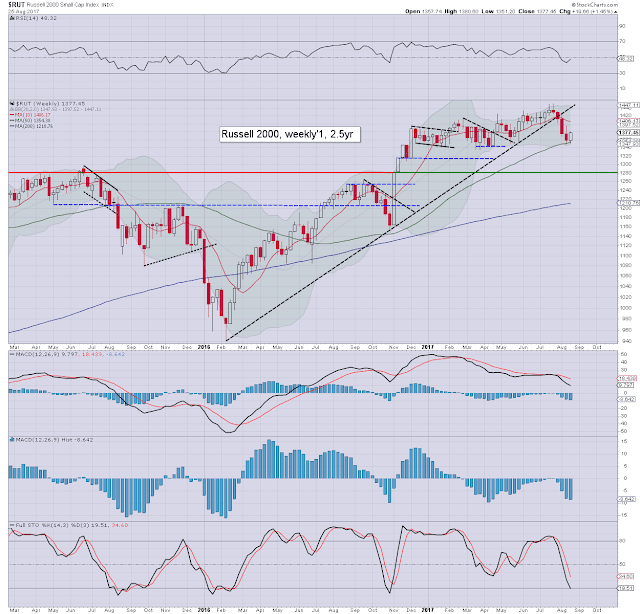 Any price action <20900 would offer a test of the giant 20k threshold by early October. The master index settled lower for a second week, -0.5% at 11699. Core rising trend - from Feb'2016, has been fractionally broken under. Next support is not until around 11400... almost 3% lower, which would arguably equate to sp'2360/50. The second market leader - R2K, is still leading the way lower, settling lower for a fourth consecutive week, -1.2% at 1357. 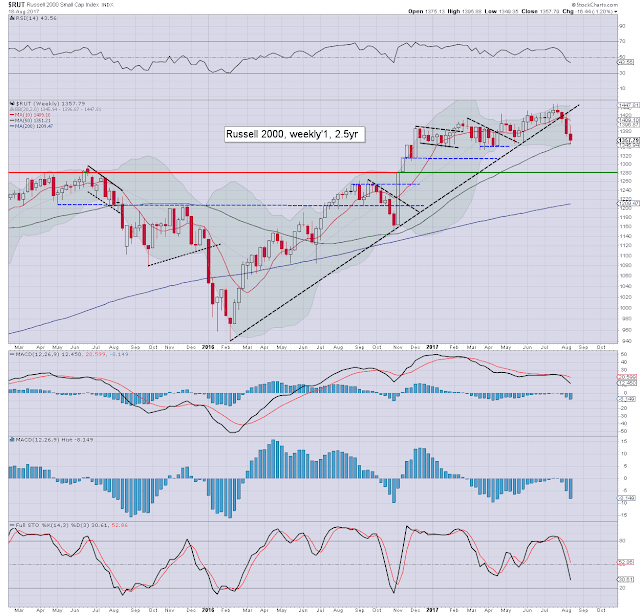 Its notable that from the recent historic high of 1452, the R2K has declined by a rather significant 6.5%. 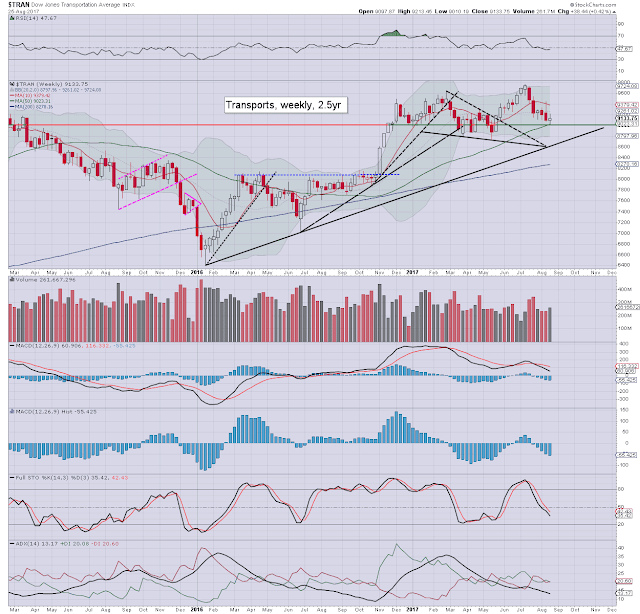 Underlying MACD is now on the rather low side, with a probable bounce to attempt to re-take the 1400 threshold. A key lower high would be a serious problem, and threaten basic downside to the 1300/1280 zone. 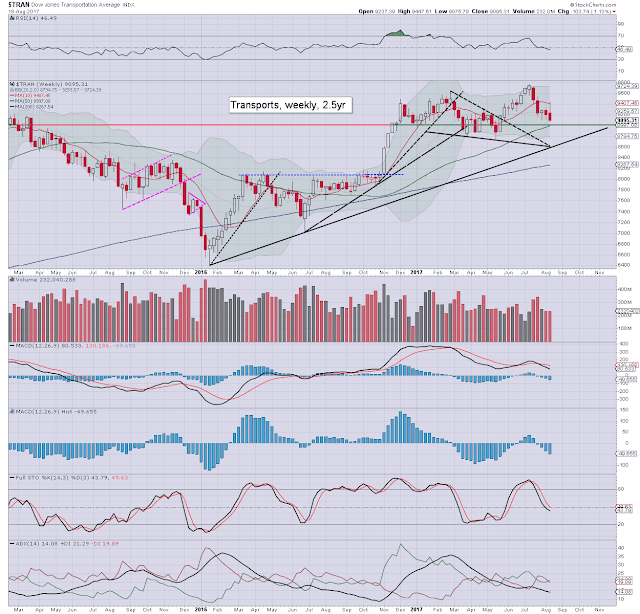 The 'old leader' - Transports, settled lower for the fourth week of the past five, -1.1% at 9095. 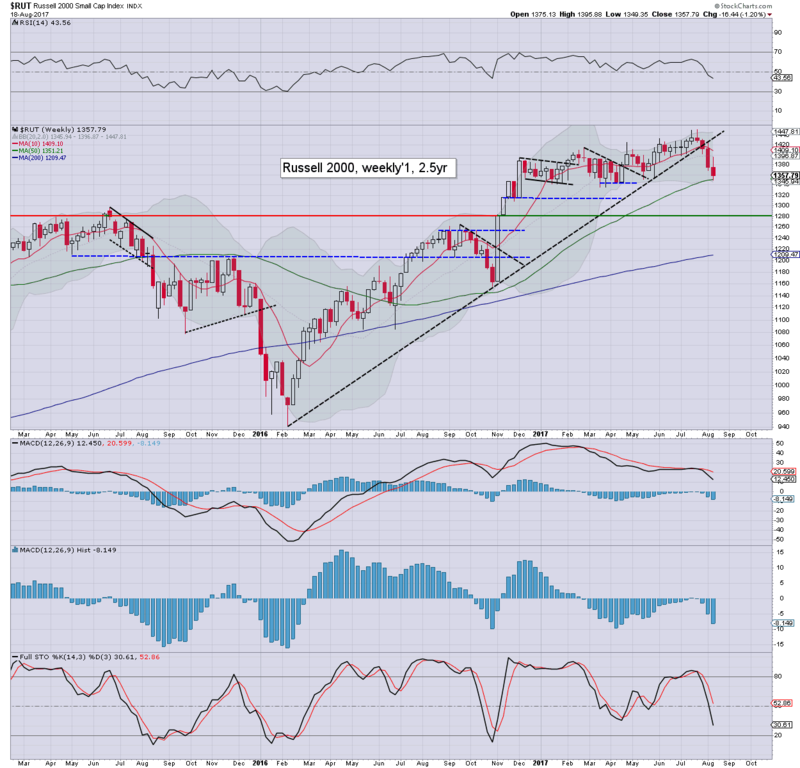 There is natural psy' level support around 9k, but the weekly close under the 200dma (9190) is rather bearish. This week's candle is a clear spike fail against the key 10MA. It strongly suggest that the 9400s are now strong resistance, and will restrain any bounces into end August/early September. Any break <9k would offer basic downside to the 8700s. In early October, rising trend will be around 8800. Any price action in the 8700s would merit alarm bells, and threaten a crash wave to around 7000 (sp'500 equivalent: 1900) - which is a powerful 23% below current levels. 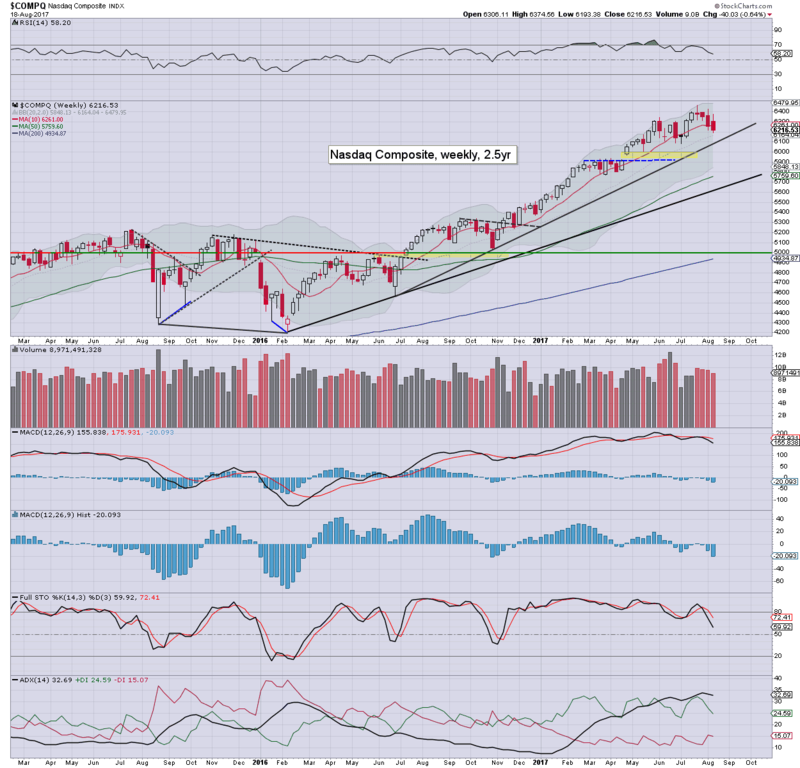 2 of the 6 indexes - R2K and NYSE comp' have settled below key rising support - that stretches back to early 2016. It remains notable that recent cooling remains relatively moderate, with the sp'2490>20 wave amounting to just 2.8%. 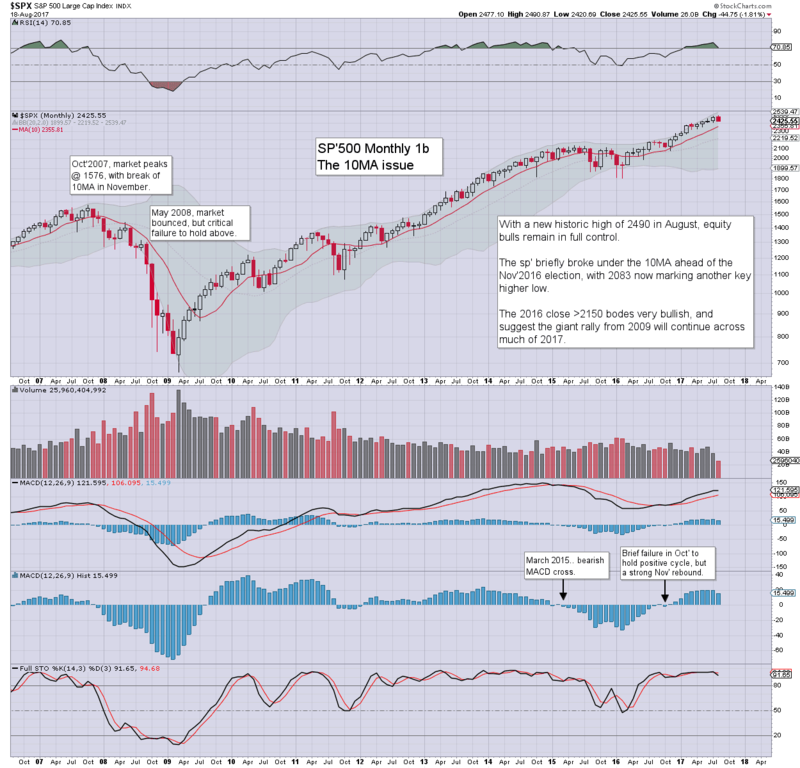 All six indexes recently broke new historic highs, which is very bullish on any basis. I recognise some prefer the 13MA, but regardless, the point is... the mid/long term trend remains outright bullish. For now, other than day/swing trading shorts, there is no reason to be strategically bearish on a mid term basis. Things only get interesting with a break AND monthly close under 2360/50. That range/threshold is climbing with each month of course. Last week saw the VIX decisively break AND settle above declining trend. The series of lower highs from Aug'2015 has concluded. Any price action above last Friday's (pre-market) high of 17.28 would merit alarm bells, and offer an initial jump to the key 20 threshold, and then possibly much higher. So, for now, there is still no real reason to be particularly bearish. The VIX is offering a hint of 'something' this Sept/Oct, but equities are still broadly strong, and close to recent historic highs. 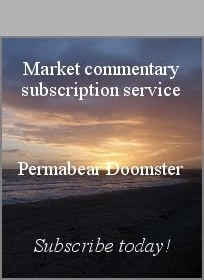 If you want that kind of perspective during the market day, then subscribe! In terms of earnings and econ-data, there is very little, and it will likely be the quietest week since early July. Jackson Hole: there will be a meeting of economists, central bankers, and other miscellaneous lunatics, beginning on Thursday, and stretching into the weekend. Yellen is scheduled to speak Friday morning at 10am, and that will no doubt garner major media coverage.